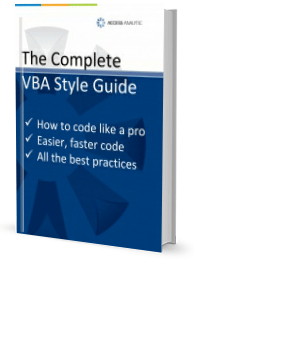 Download your “Complete VBA Style Guide” now! Why do I need an Excel VBA Style Guide? VBA, the macro language behind all Microsoft Office applications (and many others too) is fantastic for automating processes and things happen at the push of a button. However, it’s a programming language that imposes very few constraints on the programmer. This is both a good thing (you can do whatever you want), and a bad thing (people actually do whatever they want, leading to messy, unstructured code that is hard to manage). Using the “Complete VBA Style Guide” will bring structure your code, helping you write applications that are well-formed, neater, much easier to follow, and far easier to debug/maintain. What’s in the “Complete VBA Style Guide”? Everything you need to know to code like a pro! A concise “Cheat Sheet“, providing a one page, handy reference you can pin up on your wall. Clear, simple, easy-to-follow guidelines on all aspects of VBA code development. Everything you need to get you and your team up-to-speed. All the best practices that will enable you to write faster, more efficient code. View the Table of Contents (opens in a new tab). “Yesterday I purchased this style guide and I think it is great! I’ll certainly make more reference to it and have already recommended it to colleagues who are dabbling into VBA! 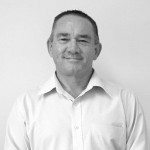 — Robert Hind, Senior Business Analyst, Centurion. If you don’t think the Complete VBA Style is useful for you, just let us know and we’ll refund your purchase. We want all our customers to be 100% happy with their purchase.